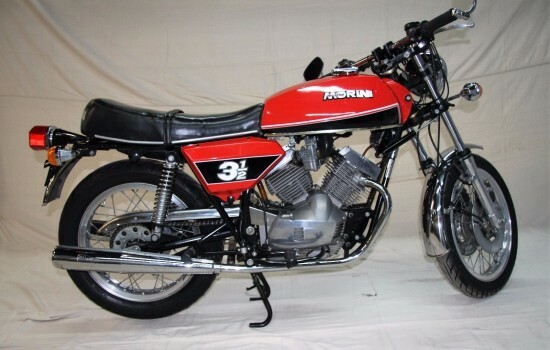 Today’s Moto Morini 3½ offers up classic Italian style from a forgotten brand. Or they would be forgotten, if it’s possible to forget something you never knew in the first place, and I’d expect that very few Americans have any idea the brand ever existed. A relaunch was tried a few years back, with the usual range of sporty nakeds and adventure-touring bikes. But they were never available in the US and while those bikes were throbbing and dangerous, they didn’t offer up anything new to buyers, except a nameplate with dubious cachet. Those bikes also seemed to lack the traditional Morini virtues as well, as the brand typically stressed handling over brute power. Motorcycling history is filled with bikes specifically built for the American market. They were often powered by newer, larger versions of existing engines and these updated powerplants were apparently intended to help us conquer the wide-open spaces of the West. There’s a reason Harley has the big bike market cornered here, and it stems from the kind of riding we do and the kind of roads we have, since many people have to drive quite a ways to find a twisty section of asphalt to enjoy. But either through hubris or simple economic necessity, Moto Morini never developed a bike bigger than the 500cc version of their 72º v-twin: the oddly-named “3½” was basically a 350 and would have been classed as a “middleweight” at the time. 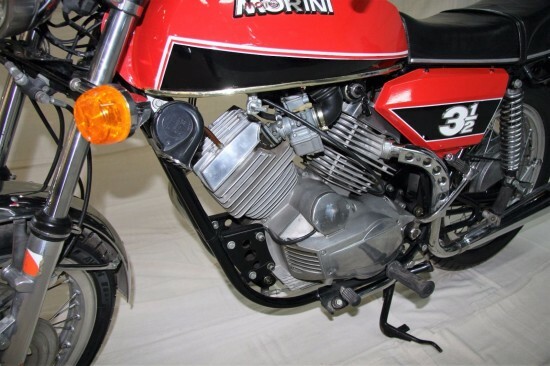 Instead, they focused on handling, and Moto Morini twins are famously enjoyable to hustle through the canyons, with a surprisingly sophisticated rubber belt-driven camshaft, Heron-heads, and a six-speed transmission. In 1977, many bikes made do with just four gears, and that six-speed would have been a very exotic selling point. 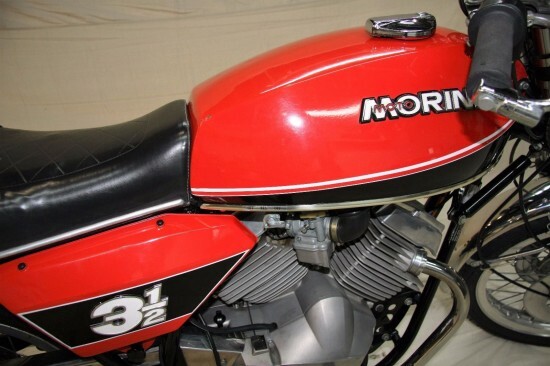 For sale is a red and black 1977 Moto Morini 3 1/2 has 8,499 miles that has been well-maintained. 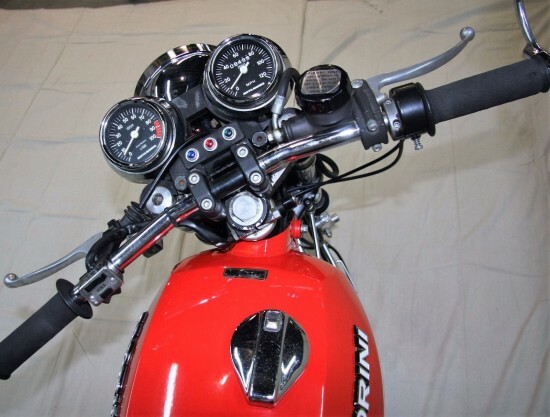 This Italian sports bike in a great original bike in good condition with matching numbers. This bike is all factory stock down to the twin factory pipes, paint and all of the informational stickers applied by Moto Morini. This bike has a V-Twin engine, 344cc motor and a 6 speed transmission. Carburetors were recently rebuilt. It is a low maintenance bike. The exterior is red and black paint with hand pin striping. The paint is in excellent condition with just one minor ding in the right hand side of the gas tank by the seat. The black leather seat is comfortable and in excellent condition with no rips or tears. This is a great bike to commute on, or blast around on a curvy road, or as a sport tourer. It is a great original bike in good shape. With less than 10,000 miles on the odometer, this is a pretty clean little motorcycle. Bidding is up to $3,750.00 and is very active, with the reserve met. Values on Morinis have seen a rise in the past year or two, but they’re still incredible bargains, compared to basically any Ducati and most Guzzis. 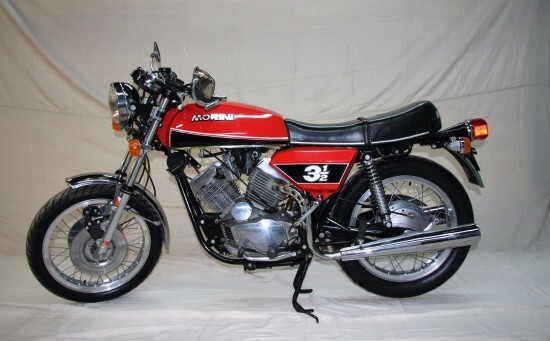 This 3½ is stylish, sophisticated, easy to maintain, and a great choice if you’re looking to buy a classic Italian motorcycle and want something just a little bit different. Good post Tad. I have been watching this for a few days. The neat thing about these is you can ride them for all they’re worth and still be semi legal. One of these will make you smile. I don’t know if this is a “Sport” or “Strada”. The Sport has about 5 more H.P.